One of the Best Local Secrets! Sitting less than a mile away from Rye, on Halstead Avenue in Harrison (across the street from Bruce Chung's) is one of the best local businesses around! I had passed by the Harrison School of Music (located at 253 Halstead Avenue, Harrison, NY) many, many times without giving the place much thought. This summer, however, when my son expressed interest in trying guitar lessons, the local music school became one of my family's favorite places! My nine-year-old son had taken a few piano lessons in the past at a different place. Although he enjoyed playing an instrument, he resisted practicing and grew to dread his lessons. 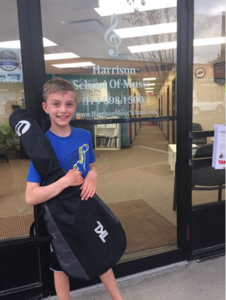 This summer, he started taking guitar lessons with at Harrison School of Music, and everything changed. He can't put the guitar down and plays (practices) several times each day without me even having to ask! Lessons have become one of the highlights of his week. My seven-year-old daughter has caught onto his enthusiasm and is eager to start piano lessons at the school soon! I couldn't be happier with the professional teaching and positive atmosphere at Harrison School of Music. Huge perks include a clean, comfortable and spacious waiting area for parents and siblings, with friendly and approachable employees ready to accommodate your schedule and needs. They also use a fun achievement-based progress program that successfully motivates students to practice and improve.